The ripe fruits of Gardenia jasminnoides Ellis. Mainly in south of Yangtze River of China. From September to November when the fruits ripen. Slightly smell, slightly sour and bitter taste. Tiny, full, thin skin, plump, reddish yellow. Unprocessed or stir-baked to brown. Bitter and cold; heart, liver, stomach and lung meridians entered. Purge fire and eliminate irritability, cool blood and stop bleeding, clear heat and relieve toxicity, clear and excrete damp-heat. For being bitter in flavor and cold in property with strong actions of clearing and purging excess heat at qi system, it is indicated for lingering high fever due to exuberant heat at qi system. For being good at clearing heart heat and removing toxicity to dispel irritability, it is commonly indicated for stuffied chest manifested as irritability, depression and restlessness. For light cases, using only this herb can achieve good effects, such as in Zhi Zi Chi Tang from Shang Han Lun. For sever cases, it is advisable to be combined with fire-purging and toxicity-relieving herbs. For instance, Qing Wen Bai Du Yin from Yi Zhen Yi De (Experience on Treating Pestilence and Rashes) , Zhi Zi is combined together with Shi Gao, Zhi Mu, Huang Lian, and Lian Qiao, etc. Although being able to purge the fire of triple energizer, it is especially good at clearing heat of heart, liver and stomach meridians. Therefore, it is often indicated for heat syndrome of heart, liver and stomach. For restlessness, delirium due to heat suppressed in heart, it is often combined with herbs for clearing heart heat. In Qing Xin Tang from Jin Yue Quan Shu, it is combined with Huang Lian, Lian Qiao, etc. For blood-shot and swollen eyes, irritability and moody emotions, infantile convulsion due to liver heat, it is often combined with herbs for purging liver fire. In Xie Qing Wan from Xiao Er Yao Zheng Zhi Jue (key to Therapeutics of Children's Diseases), it is combined with Long Dan Cao, Da Huang, etc. For epigastric pain due to stomach heat, it can be used alone. For instance, it is mentioned that it is mixed in Sheng Jiang juice and taken as decoction recorded in Dan Xi Zhuan Yao (Synopsis Edition of Zhu Danxi). For mouth ulcers, and sore throat and swollen gum due to up-flaming of stomach fire, it is combined with herbs for clearing stomach fire, such as Huang Lian, Shi Gao, Zhi Mu etc. It can clear heat at blood system and stop bleeding and be indicated for various hemorrhage syndromes due to blood heat such as hematemesis, hemoptysis, non-traumatic hemorrhage, urine bleeding, etc. For instance, Shi Hui San from Shi Yao Shen Shu, it is combined together with Ce Bai Ye, Qian Cao, etc. . It can clear heat and remove toxicity and be indicated for various heat-toxin syndrome. 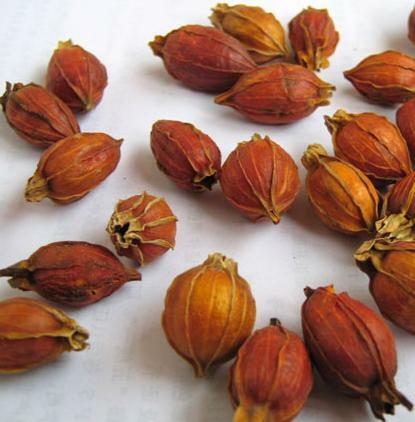 Besides for sore throat of warm diseases, it can be used for red swollen abscesses due to heat-toxin in a way of externally applying and internally taking. For instance, the single one is smashed and mixed with water to be used as a compress in Mei Shi Fang (PrescriptionS from Master Mei). Additionally, it can be combined with Yin Hua, Lian Qiao, Pu Gong Ying to strengthen the effect of removing toxicity. It has strong actions for clearing heat and dispelling dampness of liver and gallbladder, and normalizing gallbladder and it is indicated for jaundice with scanty and dark urine due to damp-heat in liver and gallbladder. It is often combined with herbs for normalizing gallbladder to cure jaundice. For instance, it is combined with Yin Chen Hao, Da Huang, etc., as in Yin Chen Hao Tang. For clearing damp-heat of bladder, it is often combined with herbs for inducing diuresis and treating stranguria syndrome to treat damp-heat stranguria syndrome. For instance, in Ba Zheng San from Tai Ping Hui Min He Ju Fang, it is combined together with Che Qian Zi, Qu Mai, etc. Moreover, it is good for stopping traumatic pain and relieving swelling. When raw Zhi Zi is grinded into powder and mixed with flour, egg white or smashed Chinese Chive, and applied on the affected area, it can treat the injuries from knocks and falls. Decoct 5~15 g. Apply proper dose for external application. 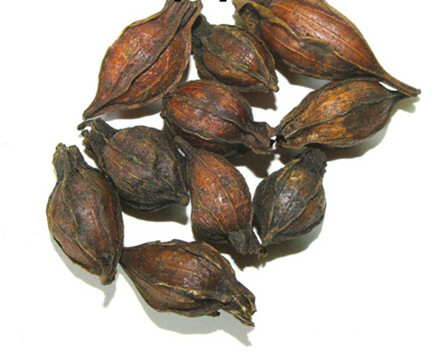 The stir-baked brown Zhi Zi is mainly for stopping bleeding. Being strongly bitter in flavor and cold in nature, it is not good for deficiency-cold syndrome because it can easily impair spleen and stomach. It is contraindicated in case of loose stool due to spleen deficiency.